Happy Earth Day! What are you doing to celebrate? I'm giving out bags at a local grocery store. Yippee! 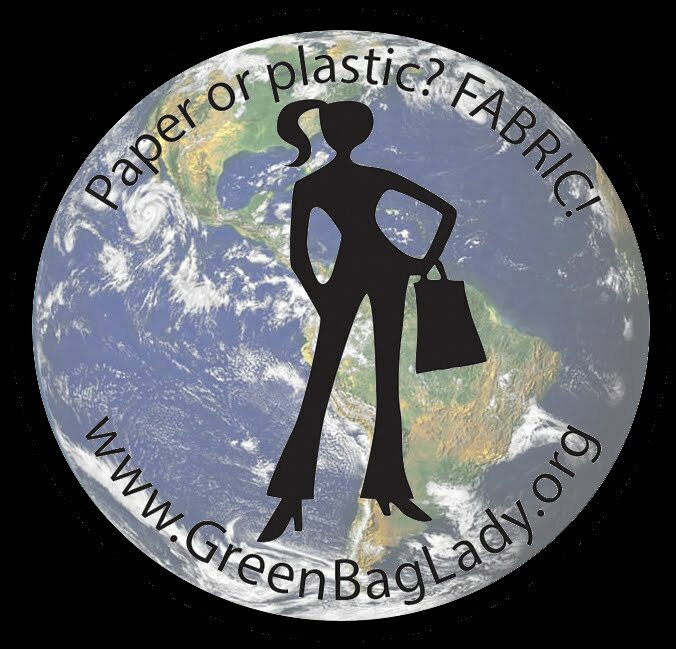 Here at Green Bag Lady we are especially excited since we have given away over 40,000 bags all over the world. Whaaaat? It's craziness. I thought I would make a couple hundred when this project started and it just keeps growing. In fact, we have just added New Zealand to our chapter list this week. I'll tell you more about Bagette Olive in the near future. 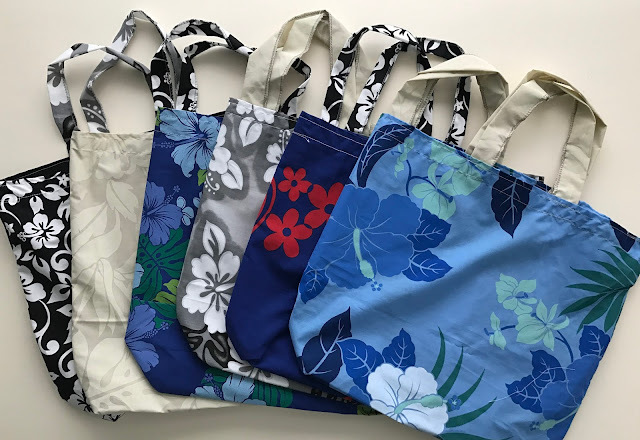 To celebrate Earth Day, this planet and all the great things the earth gives us we are giving away 20 Hawaiian floral bags. A woman in my neighborhood gave me all this fabric. So fun, so festive, so let's celebrate! We have 20 of these great bags to give away. AND one of them will be #40,000!!!! 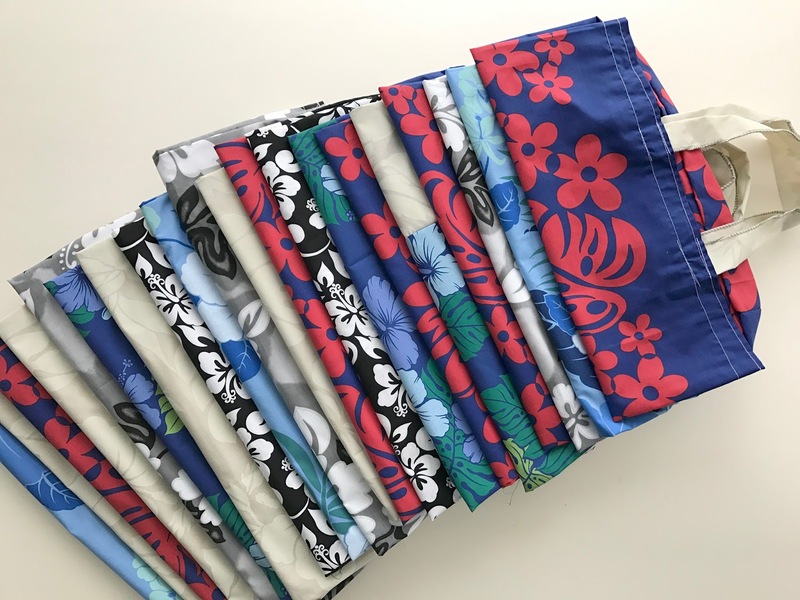 We will randomly pick 20 people to win Hawaiian floral bags. Let's save our planet! Great day! Lovely bags! Thank you, Teresa! Oh, Hawaii - ocean, beach, eternal summer !!! Well done! Thank you for your work! Such a beauty! Long live the green bags from Teresa! Useful bags. Thank you for your work. These bags are very beautiful and perfect for shopping. Thanks to you, the planet has become purer! Save our planet. Thank you Teresa. wow congratulations. This is exciting. My daughter is starting to use cloth grocery bags and she loves Hawaiian print. Hawaii is on my bucket list of places to visit. Your bags while resourceful are also great conversation starters too. Thank you so much for being so generous. robeader53(at)yahoo(dot)com. Very nice that someone gave you all this Hawaiian fabric. Aloha! To celebrate Earth Day I marched for science. Thank you for all you have done for our planet. Some day I will visit Hawaii. Thank you! Cool bag! Teresa, thaks for your work! Gorgeous as always!!! !Thank you Theresa for what you do!!! Happy Earth Day! OMG 40,000 amazing bags! Congrats! Thank you for making the world a better place. Fantastic! 40,000 bags! I would love to win #40,000! Thanks for the chance to win! really want to get this! These are all so pretty. Love these and I am blown away that you're reached 40,000!!! That's awesome. I would love to win one of these beautiful bags and then try some of my own by using your pattern and the bag as an example. I think it would be a fun way to use my excess fabrics and make them for others. Teresa, thank you for your beautiful project! These are beautiful spring flower bags. I want this. Thank you for Your work. Lovely bags. Love all the fun fabric! Melsdaisypatch (at ) gmail (dot) com. Teresa, thank you for your beautiful this bag ! but its majesty was just too great for words to fit it all. I thought about its beauty and its volume besting all. It’s hard to know just where to start when thinking of Baikal. For over 20 million years unique forms have evolved. The lake’s a bank of DNA with secrets not yet solved. shows that “survival of the fittest” is the case in Lake Baikal. and all those plants and species where endemic forms are real. or even for one country using it to gain some pride. yet if it’s not protected… then it’s one we don’t deserve. will take a toll on Baikal…not for better, just for worse. So how can we preserve Baikal and show we really care? That’s a question that will haunt you… once you have been there. Seasons come and seasons go in ancient Lake Baikal. I’m in wonder of that treasure. I’m in love with Lake Baikal.